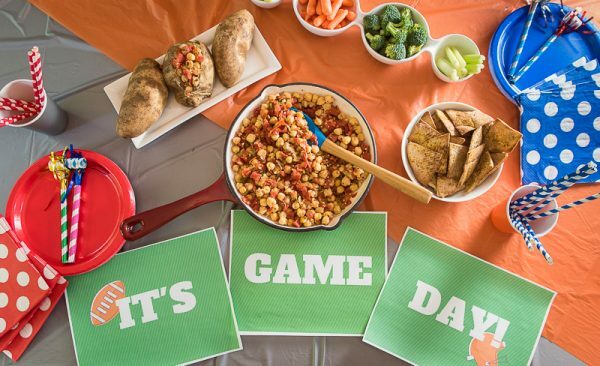 Home » Recipes » Vegetarian » Chickpea Tomato Dip + Football Party! 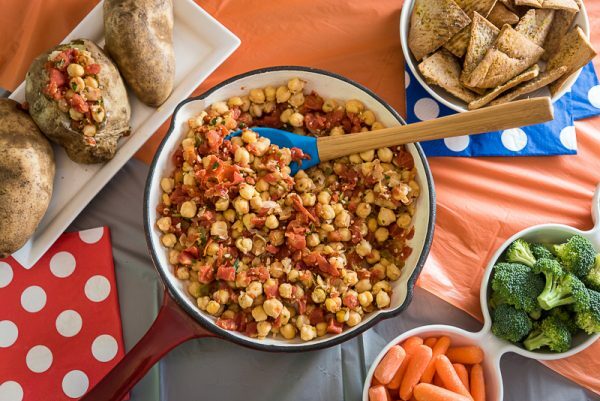 Chickpea Tomato Dip + Football Party! 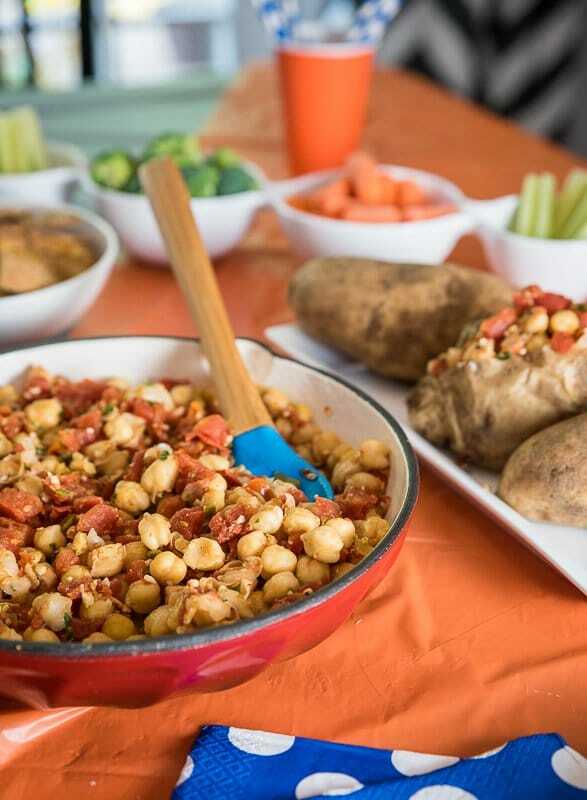 This chickpea tomato dip is the perfect centerpiece for your next tailgate party. It’s packed with flavor from RO*TEL tomatoes, Serrano peppers, and fresh cilantro! 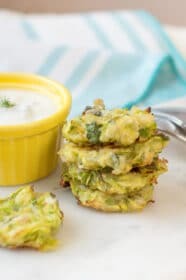 Serve it with your favorite chips, veggie dippers, or even as a hearty topping for baked potatoes. It’s that time of year again. Football season! It’s the time when we get to gather with our friends, cheer on our favorite teams, and throw amazing tailgate parties!! Back in college, tailgate parties were literally that. We would pack up our favorite snacks and beverages and stake out a spot in the parking lot of the football stadium to cheer on our school. These days, “tailgating” usually happens at home. Often with a small army of children running through the festivities. But as nostalgic as I can get for the good old days, I honestly think the adult version of tailgating may be more fun. We definitely get way better food- and probably feel a whole lot better the next morning! My husband and I both attended big football schools – the kind of towns where the whole city comes out for game day. In one memorable year, our college football teams played each other for the national championship. And then a few months later, our respective basketball teams played each other for that national championship as well. Much to my husband’s continued disappointment, my team came out victorious in both games! And we’ve had a friendly (mostly) rivalry going ever since. This weekend, I had the idea to host a “rivalry” themed football party! We served some amazing food, decked out the house in our teams’ colors, and invited over some friends for the festivities. It was a big hit. And so I now feel qualified to share a few tips on how you can host the best football party on the block! Tip #1: Have fun with the decorations! For my rivalry themed party, I decorated half the table in my team’s colors and the other half in my husband’s team’s colors. It made for a really fun and festive spread. Everyone had fun choosing the colored plates and cups that matched with their favorite team. Tip #2 Where the food goes, the people go! Seriously. Wherever you put the buffet- that’s where you should expect people to gather. I learned this lesson the hard way in my last home. We had a beautiful old house, built in 1916. But the kitchen was small and completely closed off from the rest of the living area. After several parties spent huddled up with the crowd in my tiny kitchen, while the game went unwatched in the next room, I learned to put the food out in the main living area! Tip #3: Choose an anchor dish for your food spread. I love cooking for my friends. But once my guests have arrived, I really just want to spend time with them. I mean, that’s why I invited them, right? So when I am hosting a party, I look for menu options that won’t have me running to the kitchen constantly. For this party, I landed on an amazing Spicy Chickpea Tomato Dip. I love using hearty dips as an anchor for my menus, because they can be served so many different ways. For guests that are just looking to graze a bit, they can help themselves to a scoop of dip and chips. But the same dip can also be heaped onto a steaming baked potato for a filling meal. 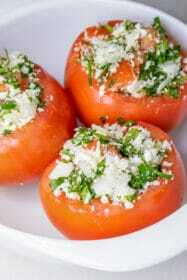 The star ingredient for this recipe is RO*TEL tomatoes! I seriously love these tomatoes. 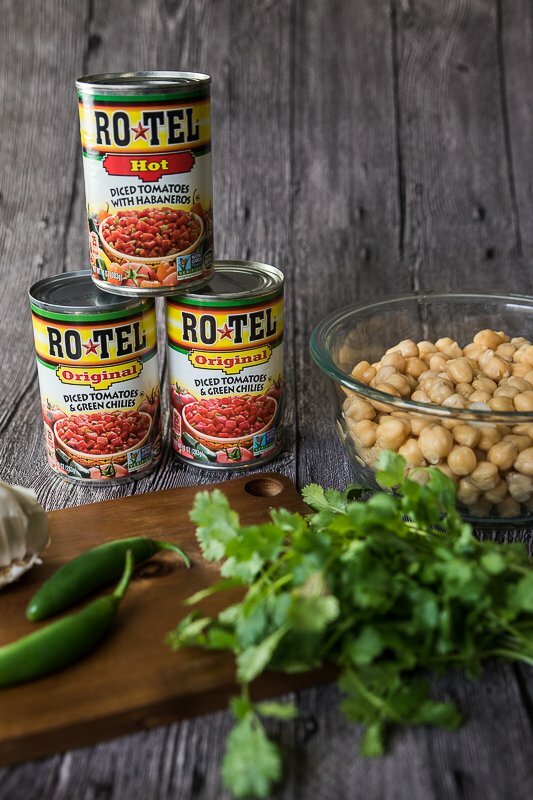 They are not your ordinary canned tomatoes – RO*TEL’s secret spice blend and green chiles add a delicious zing to everything! 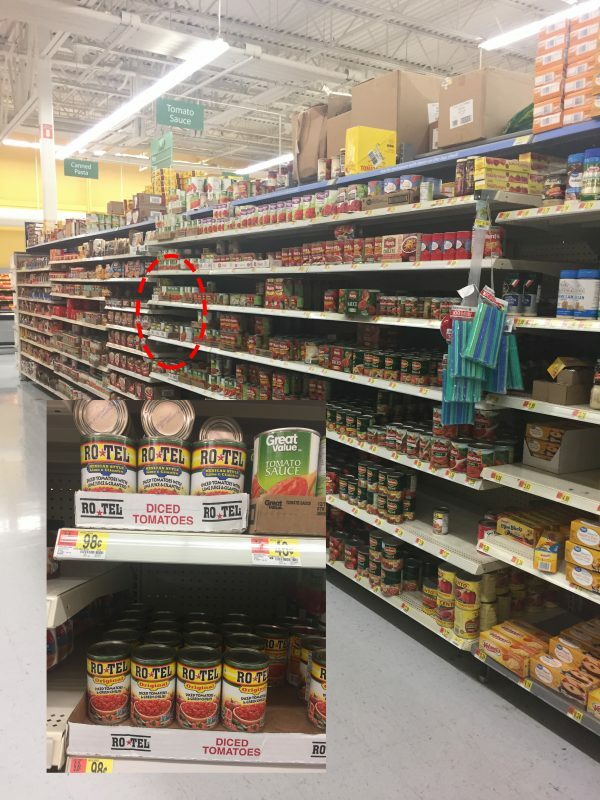 I found the RO*TEL tomatoes at Walmart (where I also purchased the party decorations). Here’s where you can spot it! This dip recipe is pretty simple to prepare. I made a huge serving so that I would be sure to have enough for all the hungry football fans. I started off by cooking a bit of garlic and a Serrano pepper in olive oil. You can leave out the Serrano peppers if you prefer a milder dip – but I like things spicy! Then I just added two cans of RO*TEL original tomatoes, plus one can of the Hot variety to give it some extra spice. I mixed in two cans of chickpeas and a bit of fresh cilantro. Cook everything together for a few minutes until it’s warmed through. And that’s it! It couldn’t be much easier. For serving, I offered up a variety of options. My famous spiced pita chips were definitely the crowd favorite. 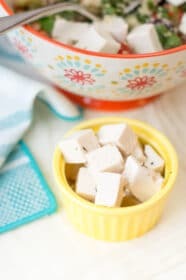 These are also really easy to prepare. You simply slice the pita bread into triangles, spray it with a light coating of olive oil, and sprinkle with your favorite spices. I used salt, pepper, and a bit of cumin to complement the flavors in the RO*TEL Spicy Chickpea-Tomato Dip. In addition to the pita chips, I served a variety of fresh veggies for dipping. And for hungrier party-goers, I offered baked potatoes that could be loaded up with the dip for a hearty meal. So I ended up with a full party spread, and I only had one main dish to prepare. Love that! 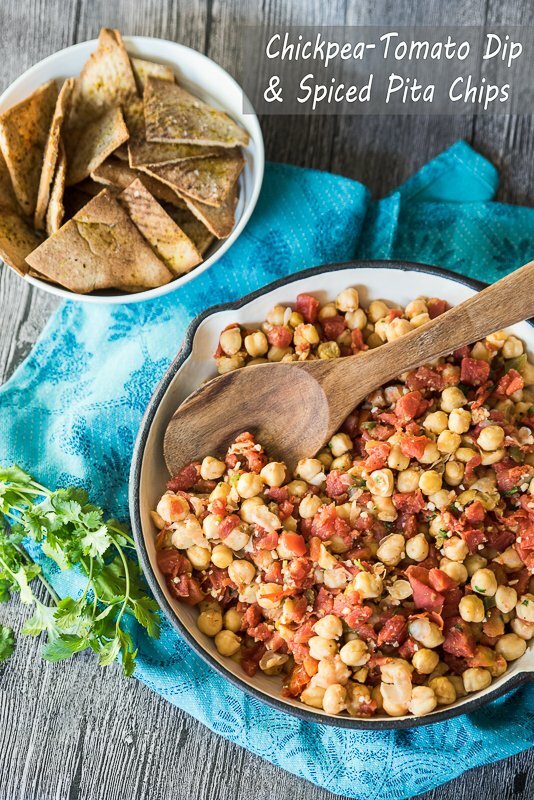 Get the full recipe for the RO*TEL Spicy Chickpea Tomato Dip and Spiced Pita Chips at the bottom of this post! Tip #4: Keep the kids busy! This might be my most important tip. I love playing with my son as much as the next Mom. I promise, I really do. But when you’re in the midst of the final game-winning play, you do not want to hear the infamous “Moooooooom” call. You know the one I mean – it’s expressed in a high pitched voice and drags Mom out into two syllables. So make sure to put out some fun activities for the kids. I have found that bubble wands and party blowers are great choices. They are good for hours of cheap entertainment! 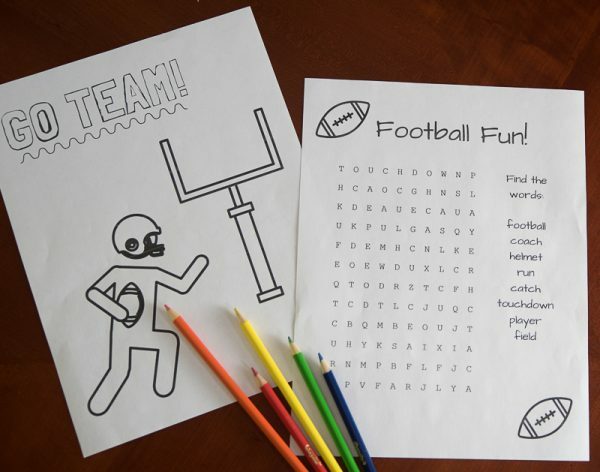 For this party, I created some quick printable activities for the kids including a football themed word search and a coloring page! The kids really loved these and kept them busy while the adults enjoyed our food. 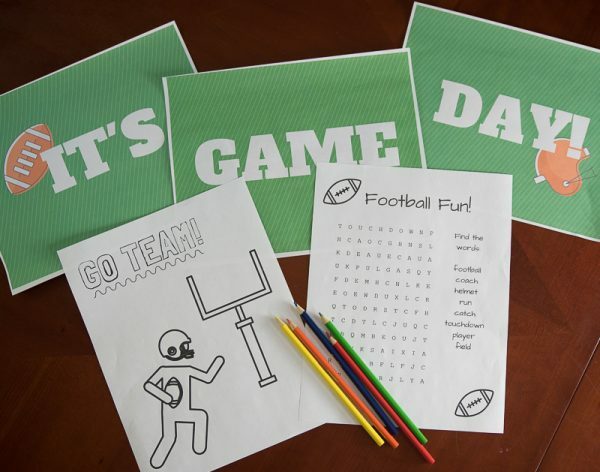 I had so much fun creating the “It’s Game Day!” banner that you see in my photos, and the word search and coloring page for the kids. I would love for you to use them for your next party too! Grab them here. 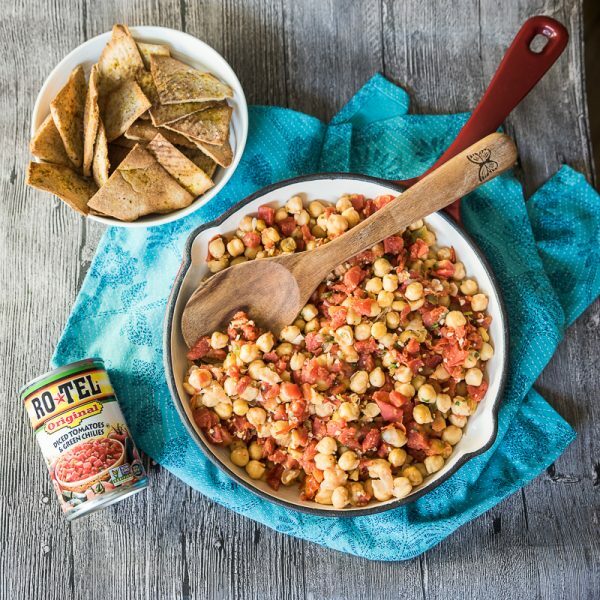 This chickpea tomato dip is packed with flavor from RO*TEL tomatoes, serrano peppers, and fresh cilantro! Serve it with your favorite chips, veggie dippers, or even as a hearty topping for baked potatoes. Start by making the pita chips. Slice the edges from the pita bread and cut into wedges. Spread the pita wedges on a baking sheet. Spray with olive oil. Sprinkle with salt, pepper, and cumin. Flip pita wedges. Spray other side with olive oil. Sprinkle this side with salt, pepper, and cumin also. Bake pita chips for 5 minutes. Flip, and bake for additional 2 minutes. Remove from oven and set aside. Next, make the dip. Lightly spray a non-stick pan with olive oil, and heat over medium heat. Add garlic and Serrano peppers. Cook for 2-3 minutes, until softened. Add chickpeas and cook for 5 minutes. Add RO*TEL Tomatoes. Bring to a boil, then simmer for 10 minutes, or until thickened. Stir in cilantro. Serve dip with pita chips. 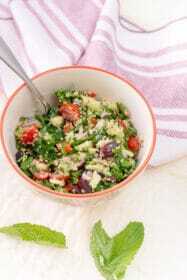 This looks so yummy!! I have been all about some chickpeas lately. I love the activities for kids! So cool! This recipe looks amazing, too. Perfect football day snack! Wow! your game day looks fun! The dip looks delicious too! Wow! your game day looks so fun! the dip looks delicious too! This looks soooo good! 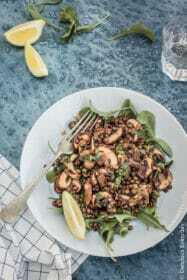 I’m a chickpea LOVER so I’ll totally be trying this! 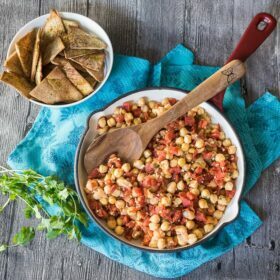 I’ve been eating chickpeas a ton lately and this dip sounds amazing! I like you mixed chickpeas with spicy ingredients. So good! Love the looks of this dip! Perfect for football tailgates this season!